We are proud of our exclusivity policy which is one of the most important ingredients to our success - we do not allow more than one Member per country. Watch our company video. All UFO Members are bound by the Rules of Membership and must ensure compliance with these rules. Please check our Vacant Countries page to find out if the exclusive representation of your country is available and feel free to download our FAQ Brochure. 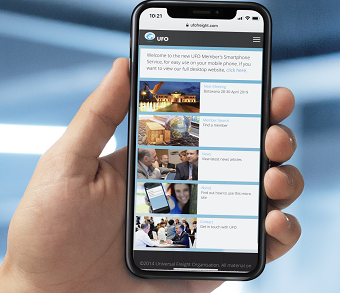 UFO is one of the only remaining freight forwarder networks that has maintained its 'one company per country' policy (with the exception of USA and China). All Members are invited to attend our Annual Network Meetings to exchange leads and develop business. The event is a great opportunity to meet overseas agents that you would never normally visit. Members have access to our online program which allows delegates to set up 20 minute private business meetings prior to their arrival. Our next meeting will be held in Botswana in April 2019 and will be a unique opportunity for our Members to be the only representative from their country in the room. 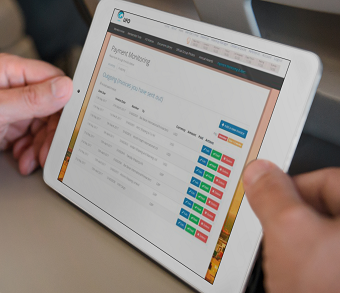 UFO provides brochure websites, customised for each of our Members and based on a company specific URL. 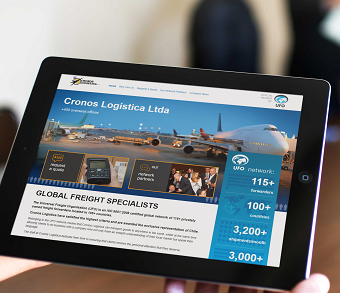 The websites showcase the huge capacity that UFO and its Members have for supplying complete logistics solutions in 100+ countries. We have created the sites in a collapsing responsive design so that it scales on smartphone/mobile devices automatically. See a list of all our Brochure Sites online. An exciting feature is the ability for Members to post their company news to the sites. Members may also request a copy of our Marketing Brochure, which will be edited with their company details and emailed in PDF format ready for printing. Additionally, we like to work closely with Members to identify new clients in their respective countries, assisting in providing references and relevant information in order to help them secure new contracts. Our customised world maps are often used as a sales tool when at meetings, on websites, etc. The UFO Head Office acknowledges the tremendous growth in the use of smartphones and tablets. However, connection speeds can often be frustrating. We want UFO Members to have a great experience with our website, whether on a large PC screen or on their mobile devices. Therefore, we provide a Smartphone Service, where the contact details of fellow UFO partners can be found quickly by searching in alphabetical order by country or company name. The News Feed feature our latest articles and not only provides excellent promotion but also enables users to keep up-to-date with their overseas partners. The micro site m.ufofreight.com is for use by UFO Members only and details are provided upon joining. The UFO Head Office distributes a quarterly Digital Newsletter to all Members. Each issue includes articles on Member’s projects, staff changes, changes in customs procedures, the latest companies to join, reminders of membership tools, official updates, etc. Combined with the Latest News section of our website, we offer our Members pro-active management and up-to-date information. Read more. The UFO Head Office offer full time pro-active management to assist our Members. We also form collaborations with the top industry exhibitions and provide regular updates published on our Latest News page. Abidance of our Membership Rules and Code of Conduct is essential for the professional, efficient and respectable operation of the Universal Freight Organisation. All official procedures are in accordance with our ISO 9001 and ISO 14001 certification. See Help and Support. The UFO Membership Map lists the full company names of all our Members in alphabetical order by country. The UFO Location Map has been designed for Members to take to sales meetings to show their existing and potential customers where their fellow UFO overseas offices are located. The map shows the exceptional global reach of our organisation. Both maps are held in our Members Area. One of the main challenges in our industry is the lack of training and staff development, especially with new and young staff members. Practical ‘on the job’ experience needs to be paired with theoretical knowledge, as this leads to a deeper understanding. However, training courses and workshops are often expensive and involve travel and time away from the office. 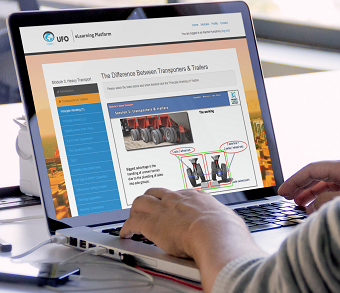 We are delighted to provide our own eLearning Platform. The first 5 module online training program is "Heavy Transport". Besides the benefits of not having to travel, there are additional advantages to eLearning - such as being able to stop the training at your convenience and start again when ready. When the training is completed the user will understand the practical, operational and engineering aspects of heavy transport, heavy lift and project cargo. View online brochure. Our website contains an online Quote Form for visitors to obtain rates. All rate requests are forwarded directly to the relevant Member(s). Our targeted advertising campaign with Google drives large numbers of visitors to our website and our Members are regularly quoting importers and exporters for their transportation requirements. Upon joining, you will have the opportunity to distribute your company press releases and news via our protected Mailing List to 900+ computers worldwide. The system is fully monitored and was chosen in order to provide Members with a safe and secure system of communicating without outside interference or advertising. It is important to encourage healthy cash flow within our network and to prevent late payments. The UFO Head Office consulted both specialist lawyers and insurance companies to investigate the best options in which to financially protect our Members, including bond systems and group liability insurance programs. The outcome is that they can in fact be highly illegal, have complicated tax implications but more importantly, be open to fraud. Therefore, we provide an Online Payment Monitoring System. Once logged in each Member can add, view and edit details of open invoices. The system automatically sends a fortnightly statement to every Member detailing any open invoices and highlighting their due date. Please complete all questions on our Application Form and supply contact details for 2 trade references. The UFO Head Office will then review all information and obtain references. If your application is successful, you will be invoiced a one-off Joining Fee (GBP £200) and the Annual Membership Fee (GBP £420-£945 depending on your location). Upon receipt of your fee, you will receive exclusive representation of your country with full membership benefits. Please only apply for membership if you intend to become a fully active member. Attending our Annual Network Meetings, contacting fellow offices and being visible is essential – the saying "out of sight is out of mind" holds very true when it comes to freight networking organisations. It is essential that each member makes every effort to do business with their fellow UFO partners. Hence our rule that requests when new business comes into the office, it must be offered for quoting to the UFO Member in the relevant country.